My first convention of the year is in about 2 weeks which means I'm in full-on sewing mode. So if I disappear on social media or seem a bit grumpy, it's because I'm tired and a little stressed. Sorry. To get me through the stress right before a convention, I find myself getting lost in audio books and music. It helps me zone out and just sew. 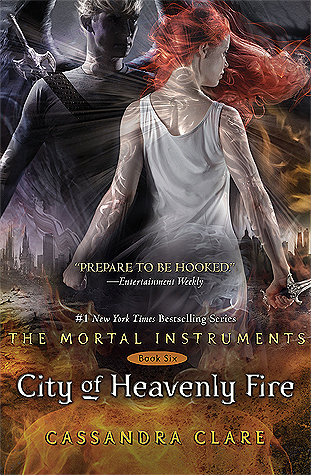 I finally listened to the last book in The Mortal Instruments series, City of Heavenly Fire. It was a good ending to the series and had a few twists that had me quite invested in the story. I don't feel sad that the series is over. It was a good time in the series to wrap things up. However, I am now interested in reading the other series that take place in the same universe; The Bane Chronicles, The Infernal Devices, The Dark Artifices. I really like the world Cassandra Clare has created and I'm ready to become connected to other characters in this universe. Lana Del Rey released a new single and video last week. To say I'm obsessed is an understatement. This new single has led me to listening to her previous albums on repeat. They have been providing a great soundtrack while I get lost in sewing. Though I keep coming back to 'Love' to listen to at least a few times each day.